Have you been seeking an effective and attractive way to attract more attention to your business storefront? Finest LED Signs offers a wide array of products with display capabilities that are sure to catch your customer’s eye. All of our signs can display either one or two lines of text, which can be set to run simultaneously at different speeds for dynamic message interplay. All of our top-of-the-line products come equipped with amenities such as pre-loaded graphic images and animations, as well as dozens of fonts and special effects for you to perfectly customize the display to your business’s message! The tri-colored LED bulbs will run for a staggering 100,000 hours producing crisp, super-bright images all the while. These displays can be operated with a hand-held remote and installed both in- and outdoors for maximum convenience and impact. Also included is a limited warranty on parts and in-factory labor, as well as an easy installation kit for ceiling or wall mounting. So don’t hesitate: contact Finest LED Signs today and give your storefront some sparkle! Greater Baton Rouge Signs is now proud to offer Cason-Bradley signs in addition to its already extensive line of products to fulfill all your sign needs. Cason-Bradley offers high quality street sign systems, ornate mailboxes, entrance signs and more, with beautiful and durable architectural detail. View their products on their website and call us today at (225) 937-3643 for pricing and ordering information. 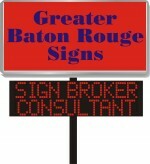 Greater Baton Rouge Signs is now proud to offer Crystal LED Light Panels. Contact us for more information today at (225) 937-3643. Click the image above or this link for the PDF version.